Provide an overview/ description of your industry. Include reasons why it’s a great industry to start a business in today. The Personal Training industry has averaged a worth of $10 billion over the past few years with a projected growth of 24% between 2010 and 2020. An increased focus on overall health and wellness has put personal training in the top 5 of fastest growing careers. This a fantastic time to get into the industry with such a large labor force to hire from. How has your industry changed in the last ten years? 20 years? In the last 20 years, there has been increased focus on custom and individualized approach to fitness. People are tired of the big box gym concepts and want more personalized and specialized workouts that can help them achieve results faster. In the last ten years, science and technology have dramatically improved the fitness industry as a whole and created many ways for people to efficiently and effectively workout and stay healthy. What trends do you see in your industry over the next five years? Next ten years? I see a continuously growing trend of more personalized approach within the fitness industry. People are becoming more and more time conscious and realizing that hiring a professional to maximize their efforts and results is financially worth it. I believe technology in the fitness industry will advance and continue to give people that extra personal touch to workout styles. It’s an industry where human interaction is essential, and people will continue to value the quality of customer service that can adapt to their fitness needs and goals. What is the biggest concern about your industry that a franchisee candidate should be aware of and investigate? There are a lot of “fads” in fitness. Things that are super-hot and popular now will in a few years have passed and gone. Also, a lot of fitness concepts give people the impression that it’s total turn-key operation, members will flock to your location, and the residual money will come easily. With more and more options, many people are forgoing the old fashioned membership route and turning to more specialized workout models. Another point of consideration is the number of people needed to make your fitness concept successful. If it’s a $9/month or even $49/month price point, you will need thousands of clients to see a return. Why do you think your company stands out in the industry? Core Progression stands out for several reasons. We don’t have a one size fits all approach to fitness. For example: if you are a spin studio or barre studio, that's all you have to offer. If the fad starts to fade you are out of options. 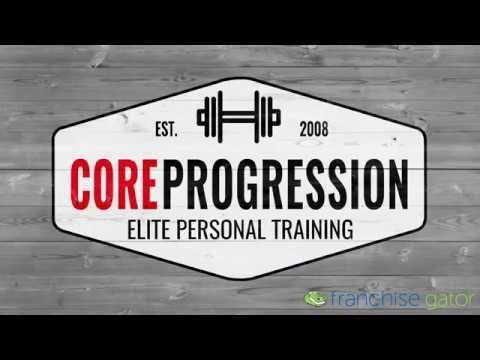 With Core Progression Personal training it’s easily customized and can stay on the cutting edge of the industry. We have multiple price point options for people to choose from and can meet a wide range of client’s needs. Our in-house wellness providers add-ons allow clients to make Core their one-stop fitness and health shop. We also don’t need to have hundreds and thousands of clients to make the studios profitable. With our model, great returns can come from as little as 75-100 clients. What makes your franchise/ business opportunity more attractive than your competitor’s? We have one of the lowest cost of entry into the industry and need only 75-100 clients making it a “low-stress model." We have a fantastic retention rate from our clients because we can always mix up our workouts, unlike other concepts that are limited to a few options. Also, Core only requires one employee which cuts down on staffing overhead and stress. We utilize independent contractors to take on most of the training, and they can set their hours. Describe the ideal candidate. Do you think your requirements are any different than your competitor’s? We are looking for driven individuals who have a passion for helping people. A background in fitness isn’t required, but good business acumen and a strong work ethic are a must. Someone who can manage and lead a team and is detail oriented will do well in our proven system. What’s the strongest skill you require in a candidate? Organizational skills are critical to being successful. We have worked hard to put systems and processes in place and to help our franchisees stay organized, but candidates will need to be detail oriented to keep on top of all aspects of a Core Progression business. Describe the working environment of your franchisees. Is your environment typical of other companies in your industry? Our environment is typical of most fitness companies; we thrive in good retail locations with high traffic and convenience to freeways. Core Progression offers a high-end boutique gym feel without the stuffiness or cost. Why has your company been successful? I believe that Core Progression has been successful because we allow our clients to get quality training at an affordable price point. We offer excellent customer service and achieve amazing results. What advice would you give someone interested in buying a franchise in your industry? Do your homework and make sure that you aren't buying into something that is a fad. Some concepts that seem cutting edge and are super-hot right now in a few years will no longer exist. I would go for a company with a proven track record and room for growth. How much experience in this industry should a franchisee candidate have should they consider buying a franchise in your industry? We’ve found that people can learn fitness. Work ethic, drive, organization, and passion for the the business are difficult skill sets to teach. Core Progression is currently accepting inquiries from the following states: Alabama, Alaska, Arizona, Arkansas, California, Colorado, Connecticut, Delaware, Florida, Georgia, Hawaii, Idaho, Illinois, Indiana, Iowa, Kansas, Kentucky, Louisiana, Maine, Maryland, Massachusetts, Michigan, Minnesota, Mississippi, Missouri, Montana, Nebraska, Nevada, New Hampshire, New Jersey, New Mexico, New York, North Carolina, North Dakota, Ohio, Oklahoma, Oregon, Pennsylvania, Rhode Island, South Carolina, South Dakota, Tennessee, Texas, Utah, Vermont, Virginia, Washington, Washington, D.C., West Virginia, Wisconsin, Wyoming.